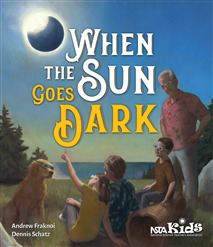 Wonderful book with beautiful illustrations and suggested “hands-on” activities to help understand moon phases and eclipses. Combined into a story-telling mode, the activities are well known and frequently used in the science education community. I asked a friend to evaluate the book with her children. Here is her response: “My 6 and almost 10 year old enjoyed the beginning of the book yesterday. We made it through about half in one sitting. It is quite dense with information, and my kids are patient and enjoy science. Of course we stopped frequently to discuss questions and act out scenes like the kids in the book. Both of them seemed to be “getting it” although this is far from the first time we have discussed these topics together. My eldest (a boy) suggested that we skip the “kiddie parts” and I think he was referring to the comments the girl in the story makes about her little brother. He did however pay very close attention to the illustrations of the kids as they worked out the models and even asked to take apart our lamp as they did in the story. My daughter, the 6 year old, was still a bit young for the finer points but remains very eager for our planned trip to Nashville to see the eclipse for ourselves. “…If I could have made suggestions at the beginning of the process I might have suggested a bit more diversity present in the family and although they emphasize that “grandma is in charge” this still is a very traditional setting and style that may not click with the very audiences that might be most important to reach. “The illustrations are beautiful and contribute a lot to understanding the content.” The book has the usual distortions of scale and orbit illustrations that suggest huge elliptical rather than almost circular orbits for the Sun and moon. These are difficult to avoid, of course. The book also tries, occasionally, to show the Sun as its true white. Still, a very worthwhile book to share with children.